Dear Tide… What Are You Doing? After seeing Tide’s latest line of television commercials, I am beginning to believe Tide hates families. YMCA: What do you have against breastfeeding? You may have noticed the recent backlash against babywearing and baby carriers in the news. As they’ve also done with the so-called dangers of co-sleeping, the media has taken a few facts, shaken them up with a lot of hysteria and myths, and come out with a sweeping indictment about a practice which has been done safely for centuries. A few weeks ago I posted about multiculturalism and anti-bias education in my post Beyond the Brothers Grimm. I’ve been continuing to think about the topic, and have come to realize that before we can begin looking out at the world, we as parents, as educators, and as human beings need to first look inward and explore our own thoughts and conceptions about our culture and heritage. Facing our own beliefs, prejudices, and uncomfortableness is necessary before we can begin to look at others’ experience with awareness and with empathy. I invite you along on this exercise, an examination of culture of sorts. Why you shouldn’t send formula to Haiti. January 27, 2010 / Annette / Comments Off on Why you shouldn’t send formula to Haiti. 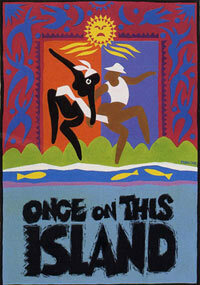 “Once on this Island” is one of my all-time favorite stories. Great score, beautiful music, powerful lyrics, all attesting to the incredible power of a good story told. What’s not to like?